So I've decided to stop spending money on bread, which often goes bad before I finish the loaf. I made a loaf last week that turned out to be entirely too dense to use for sandwiches. So today I found another recipe, over here at the Hungry Mouse. Instead of two loaves, I cut the recipe in half and made just one loaf. Since I was using self rising flour, I eliminated the salt that is in the Hungry Mouse's recipe. I dissolved the sugar into the water in my bowl, then added the yeast and let it sit for about 10 minutes or so before I added in the flour and butter. I don't have a stand mixer (yet), so I used a fork to get the mixing started, then kneaded by hand for about 5 minutes or so, until the dough was firm and elastic. 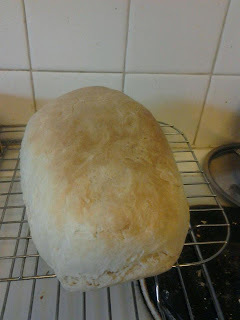 I let it rise for about an hour until it rose to a little more than double it's original size, then punched it back down, kneaded it a few more minutes and formed the loaf before I put it into the lightly greased glass loaf pan. I baked it for 40 minutes at 350 degrees in my toaster/convection oven. My only regret is that I didn't take into account that the back of my oven heats faster than the front, so I neglected to turn the loaf halfway through, in order to brown it evenly. 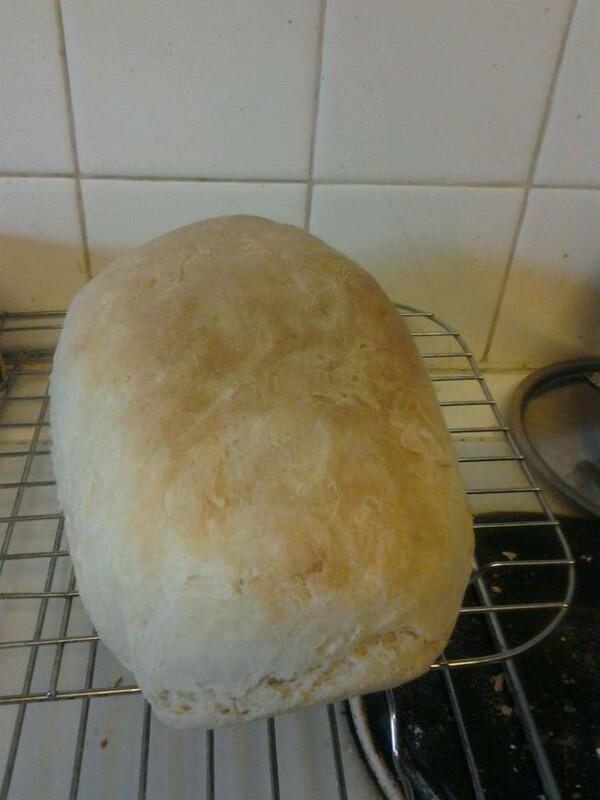 Oh I adore fresh bread. We don't buy store bread anymore either. I need to get my buns (for hamburgers/hot dogs) perfected, and then I'm set. You're so right about waiting for the bread to cool - it's awesome eating fresh, hot bread, but ... it doesn't always work so well, does it?